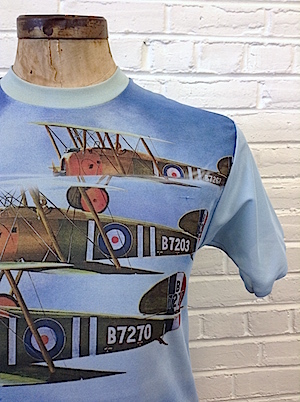 Vintage mens 1970s printed polyester t-shirt!! 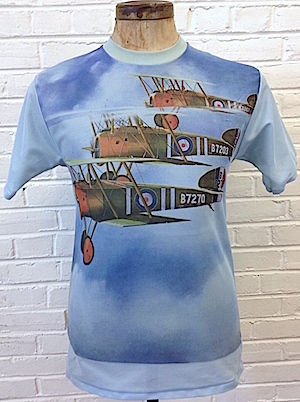 This very cool vintage T-shirt comes in blue with images of green and orange WWI British biplanes in flight! Shirt is a classic pullover t-shirt style. Tagged by Custom Casual. 100% Polyester. Condition: Very Good. Has a pull on the left, front off the shirt and a few, small brown-ish stains on the right side of the shirt. Also has some extremely faint brown-ish staining on the lower portion of the shirt. Still an amazing vintage t-shirt! Priced accordingly!